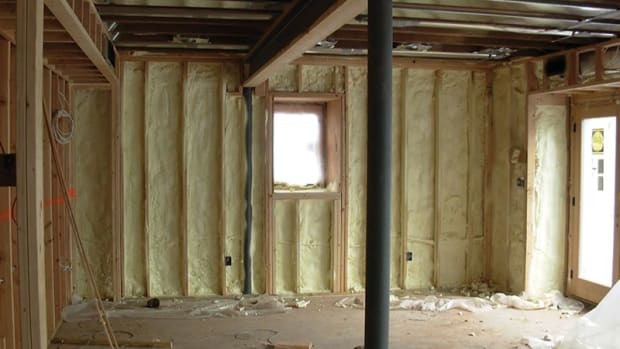 What defines a building material as sustainable or “green” can be maddeningly hard to pin down, but some concepts that have consensus behind them are durable, biobased, and avoiding hazardous ingredients. 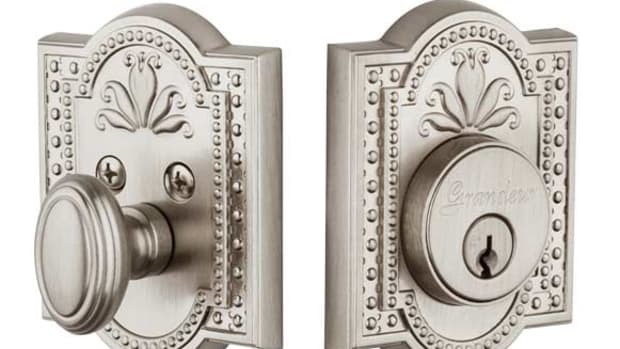 Turns out, another concept that often applies is traditional, especially in the case of kitchen surfaces that are as classic as they are 21st century. When the new gospel of scientific sanitation caught on in houses after 1900, linoleum invaded kitchens practically overnight. Linoleum remained the perfect progressive flooring through the 1940s, but by the Go-Go 1960s it was becoming an anachronism compared to trendier and cheaper vinyl and oil-based pseudo-linoleums. 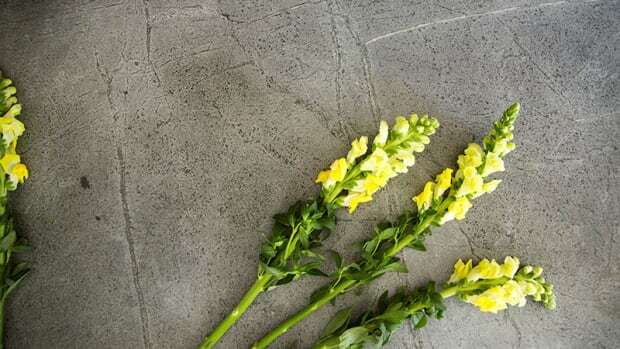 That might have been end of the linoleum story except that manufacturers in Europe, who continued to make sheet linoleum, began finding a niche in the American market in the 1990s, especially for the growing interest in environmentally friendly products. In kitchens especially, Farkus says, “Some people like to use Marmoleum sheet goods,” referring to the classic line of glue-down linoleum in scores of colors and solid, marbled, and striated patterns. Whether the goal is eco or retro, linoleum brings something to the kitchen table. “I believe any Marmoluem product would work great, however the 10” x 10” Marmoleum Modular tile really lends itself well to get a period look, such as from 1930s or ’40s”, says Farkus. “Because you can intermix so many of the different colors and sizes, it’s just a matter of personal style." Not that refinishing should be a looming necessity. “When cork flooring was introduced, the initial finish was just wax,” she says, “so the floors had to be sanded and refinished quite often. Now the finishes are so much better.” Her company’s basic finish is an aluminum oxide urethane called Greenshield and fine for residential applications. As an essential kitchen surface, countertops easily compete with floors in importance, and among the cornucopia of countertop stones and synthetics, wood still ranks high, especially in the form of butcher block. 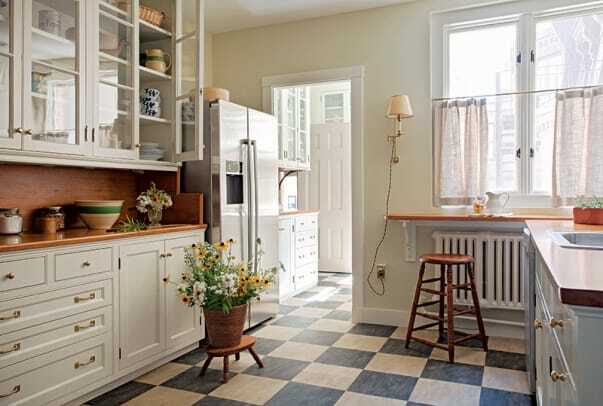 Far from what might appear to be a newfound industrial-chic material, butcher block counters date back at least as far as the first modern kitchens, prominently displayed in photographs from the 1910s and earlier. Records do not dice kitchen history down to the dawn of the first butcher block counter, but Steve Pless at John Boos and Company in Effingham, Illinois, a major manufacturer of butcher block, provides an early benchmark. “Our company was started in 1887 when Konrad Boos, a blacksmith, put a big section of sycamore tree on legs to deaden the blows from his hammer. When a visiting butcher saw the block, and wanted one for his shop, thus began the butcher block business for John Boos and Company.” Today the company is heavily invested in supplying the food service industry with stainless steel as well as wood products, which are widely accepted by the NSF (formerly the National Sanitation Foundation). In edge-grain, the other, more common butcher block construction, strips of hardwood are arranged side-by-side, then joined together similar to a bowling lane. Edge-grain construction offers more view of the wood color or character, but the edges of each strip of wood, which are the cutting surfaces, can show wear over time. 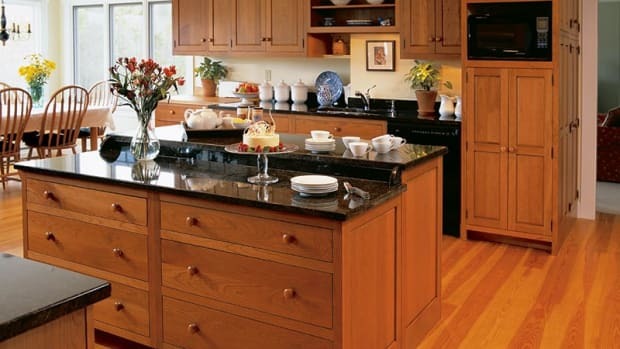 End-grain countertops are a bit more labor-intensive to manufacture than edge-grain countertops, Pless says, so they tend to be a little pricier. Also they are slightly bigger on average and often heavier, but they are frequently the butcher block counter of choice for serious cooks. housebook.com), lists “What Time is Your Kitchen?” and his other seminars and keynote addresses at www.gordonbock.com.